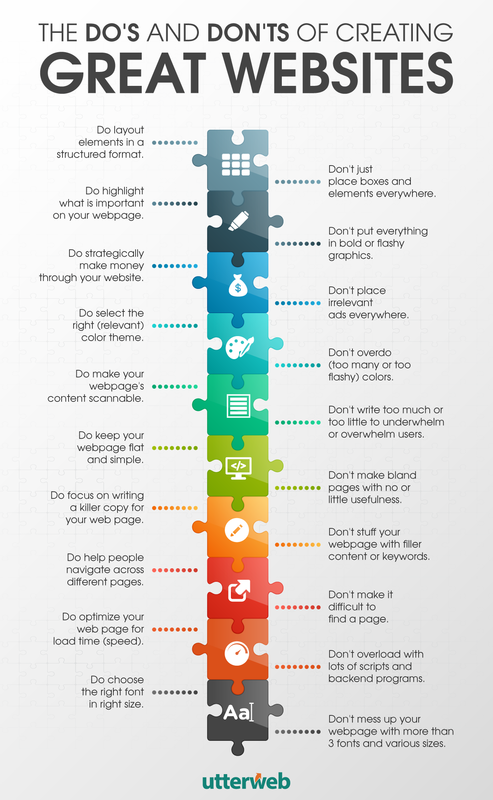 Follow the Following Dos and Don’ts for Beginners While Designing a Website. Respect your visitors, do not try to force them to read the content of your website, let them choose and decide what they want to read. So you must make your web accessible and easy to navigate. A good web design should have a good menu where they appear the practically all of the web. That will make the web more accessible and easy. Must Read: Mobile Site VS Responsive Design – Which Option is Better? Today’s infographic comes to us from UtterWeb Design. It gives us 20 ideas for successful website designs when you don’t have a clue. If you’re ever stuck, come back to the infographic, get an idea that speaks to you and goes forward creating. This post originally appeared on the Web Design section. To read more content like to this, subscribe to SEO Tutorial via RSS or subscribe by email!